I have a few favorite seed starting methods. Believe it or not, the peat pellets (in the mini, dome-covered greenhouses) work great for me for seed starting. For tomatoes, I do not use a heating pad, but for peppers, I will. I always make sure, with the peat pellets, that once the seed has sprouted & straightened up pretty well for a few days, that I pot it up to a 16 oz cup. The peat pellets are excellent only for seed starting, IMO. 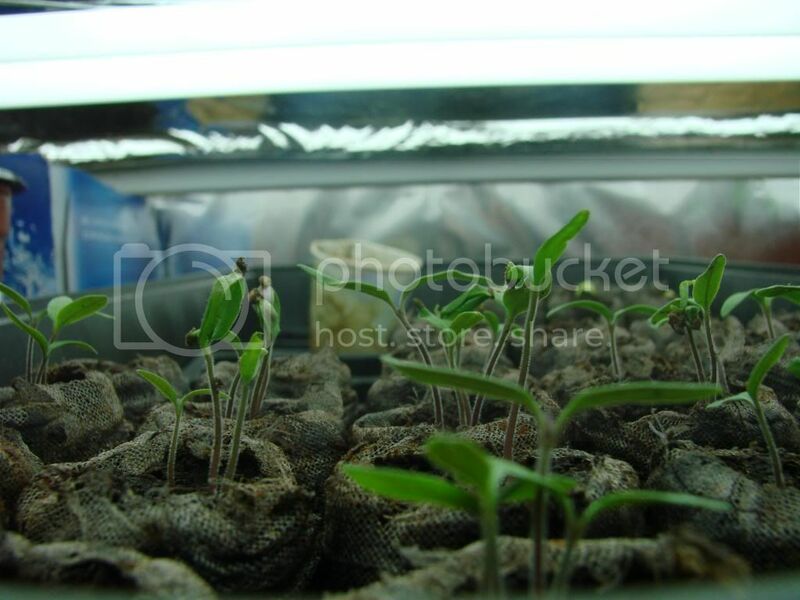 Once the seedling starts to grow a bit, they must be potted up & the netting 1110000% has to be removed (don't make me find the horror story pics of this not happening...lol). This method has always given me a 90% or better germination rate! I also like to start some herbs and other various non maters/pepeprs in peat pots or squares, but they must be kept extremely moist, as those things soak up more water than a sponge! =) Both this method & the peat pellet method, I leave the items in complete darkness until seeds germinate. One new thing I'm trying this year is one of the "Germination Stations." I have mixed opinions on it so far, probably because I made the mistake of filling the little holes with Jiffy seed starting mix, which is about impossible to get to soak up water. I think, with the proper seed starting mix, these can be great, as they come with a heating pad that is kept underneath the greenhouse. 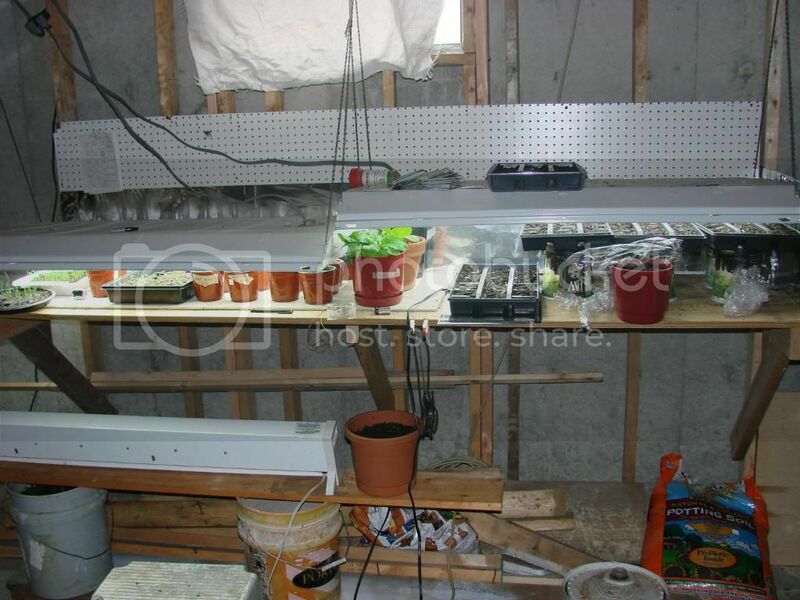 Applestar: I Don't really need drip tray, it is my unfinished basement, there is soil and wetness everywhere around my planting station, that's how I like it. I don't have the basil on the heating mat yet, I might switch out the toms with them tomorrow thanks for heads up. I loaded up 4 flats with soil and seed and I only have one heat mat. Toms come first. Not sure if you knew this but Chard seed are like 4-5 seeds in one that's why there is always extras. Didn't know that till recently I wondered why all my plants last year were doubles or more. Sounds like you got it going on as well, that's good now I won't be alone when I have 500 things need to be potted up all at once. As you know good luck to you. Oh yeah I finally bought a thermometer it usually about 65-70 under the lights. Veggiegardener:I heard about the Germination station I believe I called Lowes about heat pads they said they had something like you are talking about. I bought the heat pad insted and when I went to Lowe's I couldn't find it but I didn't look super hard. Ozark Lady was saying that Jiffy seed mix was imposible to hydrate as well I suggest mixing it with something else like maybe manure or something that will hold water, not sure if you already knew that or not. That does it... tomorrow I get some basic potting soil, and mix it together. I bet I won't buy Jiffy again! The other soil will hold water and the peat will lighten it up... there is a way out of this... I hope. No seeds started today.. but I tried..
That's a bummer, Ozark Lady. Hope you get lots of seeds started today. If at first you don't succeeed, right? Here is a seed starting tip that I don't think I have seen mentioned. For tomatoes and peppers (you could try with some other varieties, I've only done it with toms and peps), soak the seeds in lukewarm water overnight (no longer) before you plant them. If any are floating then next morning, discard them, they are no good. I did this with my tomatoes and had the majority of them germinate in about three days. A word of caution: Do not let them dry out after soaking until they germinate. If a seed drys out once it has absorbed moisture, it will die. Now, with that being said, don't keep them in a muck puddle; just keep the soil they are in moist, like you ordinarily would. Just be sure not to miss a day or two and let it dry out. Wolfie a couple of things, I bought the GE 6500K (daylight) bulbs. At my store they are not with the light fixtures they are over by the garden furniture in a long row of lights where the compact florescent and MH stuff is yours could be different. These may be the perfect to some peoples standards but they work for ME. PLEASE be careful with that heating blanket, DO NOT get any water on it, I would have to assume it is not water resistant much at all. I could be wrong, I just don't want to see you post your house burned down. Look at me giving electrical advice (i do know my stuff there though) but I think I might have burnt up my rigged up trickle charger that I was using to power some PC fans due to a dead short cause I wasn't paying attention. But still BE CAREFUL PLEASE. Off to Lowe's myself now maybe I'll see you there. One more thing I have noticed I got some potting soil at lowes that had "Moisture control" in it (not so organic but it was the only one that wasn't frozen solid to the others at the time). I didn't like that stuff it seemed to never dry out like out should to some point at least. So look at them good. I have been using the Black Kow composted manure to solve moisture issues myself. Again shop around and don't follow me to the "T" use your best judgment. If you're mixing in the heavy potting soil, it helps to cut it with about 1/4~1/3 perlite by volume. Be careful with the dry perlite dust not to breath it in. I have to add: I don't like perlite and prefer to use sand, but I confess I'm currently *reduced* to using perlite because my sand is all buried and frozen under a foot of snow! I was just going to get regular potting soil to mix with the jiffy seed starting, about half to half ratio, will that work? as for the heating blanket.. no water near it, its in my living room on my coffee table at the moment! I have to go to a political thing today, where all the politicians have opportunity to tell us why we should vote for them. That is like a kid turned loose in a candy store! You know, interestingly, last year, the Garden specific site was cheaper than the box stores, across the board, supplies and plants. All those drawers of seeds, with the little scoops, the rooms kept cool for strawberries, the green houses... oh man... my reward for listening to speeches! I am reviewing my seeds and starting supplies, I know that I need better soil to mix some seed starter. Can anyone recommend a good plant food, so that I am not bringing manure inside to make manure tea? I am organic only. I have never used commercial plant food or fertilizers, so I am totally ignorant here... Oh I do know what the npk is... and basically, that I want a balanced one, since I will be growing a variety of plants... Do I need more than one? Like for plants that like less nitrogen and more potash? Help! I have cotton seed meal, bone meal, wood ashes... what else do I need? I am only talking about seedlings to transplant, once they are in garden then the manure, etc can take over. wolfie wrote: I was just going to get regular potting soil to mix with the jiffy seed starting, about half to half ratio, will that work? Cool on the heating blanket, as far as the potting mix, mix it up a bit at a time. You should be able to tell when it is good. Grab a handful if ti feel like soil somewhat it is getting good. I don't know how else to explain it. But I go my feel myself. Half and half might be good maybe less maybe more without having here in front of me. Experiment with it you will get it right. My tom's are JUST now getting their true leaves. You can't see them in the pic but here they are. well my cucumbers are the only ones that have fully come thru so far. I know for sure now that I planted the seeds all way too deep, I think I lost the peppers but the squash may be able to still come thru. 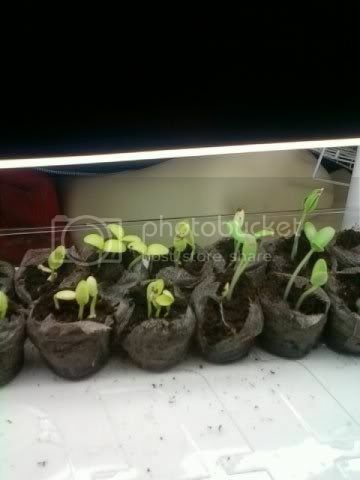 Here is a pic of my cucumbers moved under the lights that I just set up, whoo hoo me! these were planted at the correct depth, are immediately set on the heating blanket, and I am keeping the house at 60 instead of 45... praying I have better luck with these! 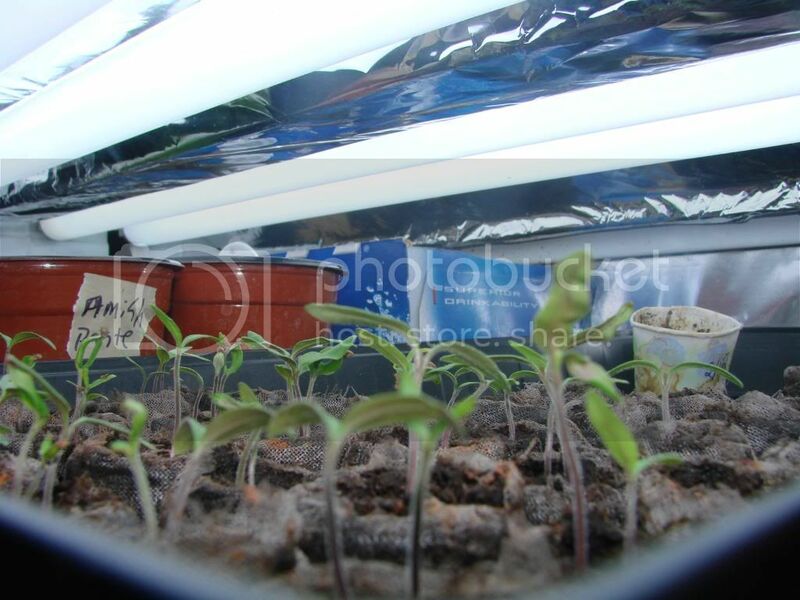 I have seeds in the germinators, (plastic shoeboxes). I mixed it 50/50. And the other soil will get wet readily. Broccoli, Cauliflower, Dill, Pak Choi, Celery, Cabbage and Brussel Sprouts. My information says the celery is slow to germinate... has anyone raised celery?